Apologies for not posting for so long but my blog was under construction and I was too embarrassed to post up any of my work. But now, after working on my blog's professional look with the great help of Ryan El, I will update you with what I've been up to during my 3rd year Minor Project. It all started around June/ July 2012 when me and Dayle Sanders decided to work on a collaborative project for our 3rd year Minor Project. Our collaboration comes with the title of Mango Mercury. We researched what we could work on and came across Thai Mythology, a cultural subject in which we were both interested in. Since we both aspire to become Character Designers and Animators , the project will be a character-oriented animated short with limited attention to the environment. Towards our submission we noticed that our Project was way too demanding to be completed by the Minor's deadline. To make the most of our final year we came to the sensible decision to extend our Minor throughout the whole year and treat it as one project assessed by two criteria: Character Design and Character Performance (or animation). Below is what we handed in for our Minor (Character Design), including the characters' final turnarounds and the Art Of Document. 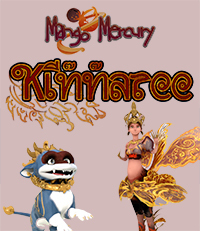 If you want have a look at the progress behind this visit the Mango Mercury Blog. Our project will continue with preparing the characters for animating and eventually bring them to life, refining the editing with a Final Pre-Viz for the story and enhancing the environment around them. Stay tuned for more updates. your new blog template is cuuuute! ((:D love it! Thank you both :)It took me a while to decide to change it. And yes, hopefully Kinnaree is going to turn out alright. The hardest bit starts now. Fingers crossed!